Now you can use Anchor to layer your voice on top of anything you discover on the Internet. It’s been extremely rewarding to watch such an awesome community of people forming and using Anchor as a way to speak to each other from all over the world. One use case that has really stood out to us since the early days of our beta is people using Anchor to add commentary to articles, tweets, photos, and anything else they happen to be exploring on their iPhones. So we decided to make it really easy to do exactly that. 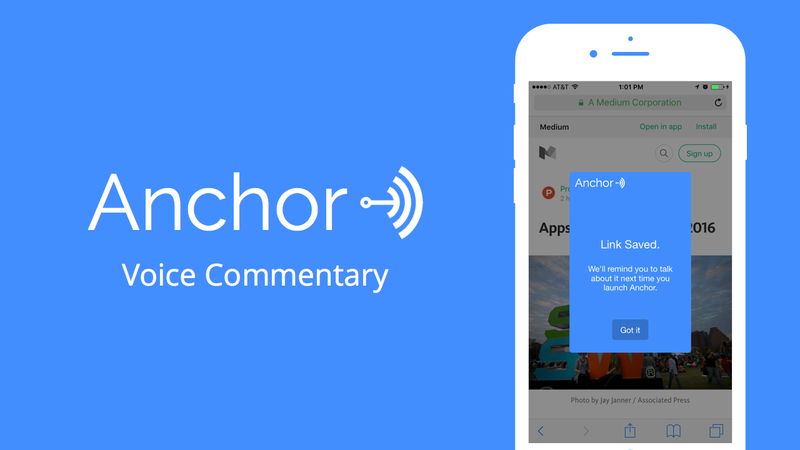 Anchor Voice Commentary is an iOS share extension that lets you send any URL to Anchor as a bookmark. The next time you launch Anchor, you’ll be reminded to talk about what you discovered, and when you publish your wave, a URL to that content will automatically appear in the wave’s caption. Every time you click the Share button in Safari (or any other app that shares URLs), you’ll see Anchor in the list of options. In addition to Voice Commentary, we’ve got a couple of other important updates in today’s release, including Reply Filters, which makes it easier to surface your replies, and indicates which waves you’ve already heard. Can’t see the above player? Open it in a new window. P.S. — we’ll be at SXSW! If you’re interested in connecting with us down there, or learning what we’re up to, just head to this Google form.